Hi guys, I don’t usually post on the weekends but I’ve been holding onto the photos for this Loaded Baked Potato and Cauliflower Soup for weeks now and wanted to get it post while the weather is terrible and we’re all freezing. I had plans today, got all the kids in the car, and then immediately drove home after putting gas in the car because I literally couldn’t. Everyone keeps saying, “Amanda, it’s February, of course it’s cold” but y’all, last February I was wearing sleeveless dresses in New Orleans during Mardi Gras and not complaining about it being too cold to have a Jeep. 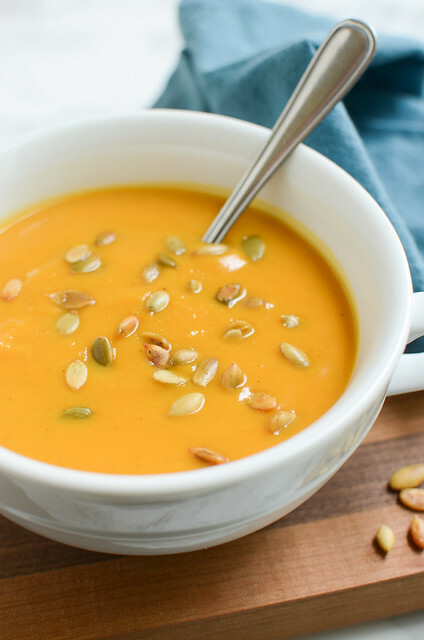 This Loaded Baked Potato and Cauliflower Soup recipe comes from my new favorite cookbook, Healthyish by Lindsay Maitland Hunt. 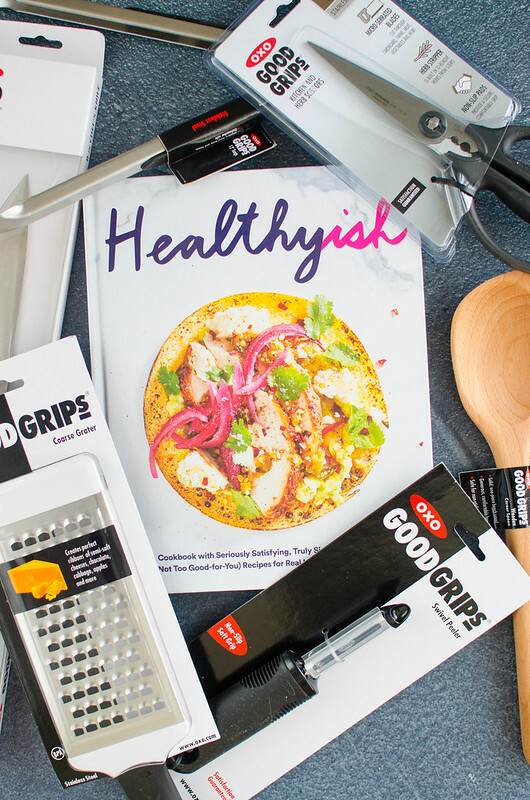 I’ve actually had it on my wishlist since Gaby announced it as one of her cookbook club books so when OXO offered to send it to me with a bunch of tools needed to make this recipes? Umm, how could I say no to that? So Healthyish is exactly like it sounds. Recipes that are healthy enough. Like this one. 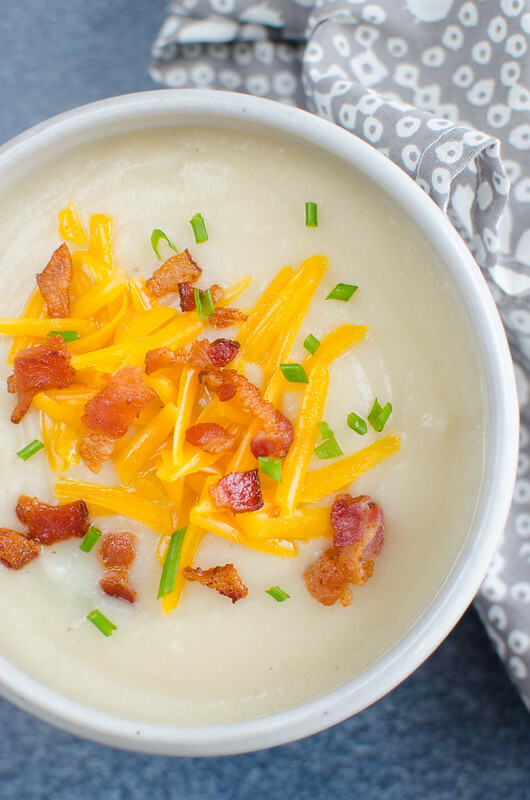 Maybe loaded baked potato soup isn’t the healthiest option but if we add cauliflower, it’s healthyish. The book is gorgeous and you totally need it if you’re the kind of person that wants to eat healthy but isn’t about chicken breasts and roasted broccoli every night. And shoutout to OXO for sending some of their amazing kitchen tools. I’m obsessed with the Kitchen & Herb Scissors – they cut through meat, veggies, twine, whatever like it’s nothing. Plus, the 8″ Chef’s Knife chops like a dream, the Swivel Peeler made my least favorite kitchen chore (peeling potatoes, ugh) painless, and the 12″ Tongs were perfect for flipping bacon. The Wooden Corner Spoon is gorgeous and made sauteing up the onions that much easier. And finally, the Coarse Grater – I used it for cheese for this recipe but I used it to grate up some sweet potatoes last week and it worked beautifully. And if you’ve ever tried to grate a sweet potato, you know that it can be a giant pain if you’re using a not-so-great grater. Everything looks amazing in my new kithen and it makes cooking so much more fun when your kitchen tools are pretty. Thank you OXO for all the goodies and make sure you check out Healthyish! 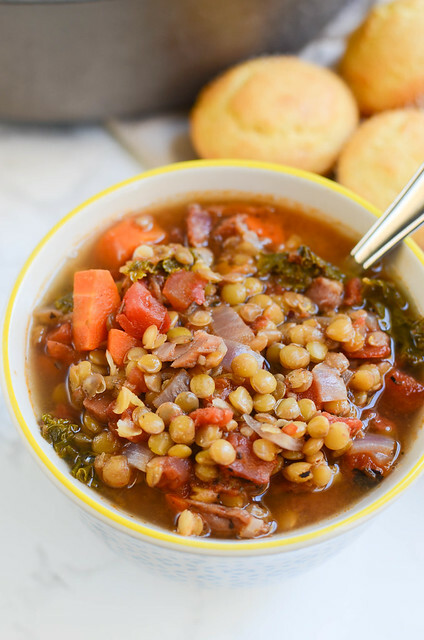 This soup is really simple and really quick to put together (like most recipes in Healthyish) – just a few ingredients and it’s probably all stuff you have on hand. Potatoes, onions, cauliflower, bacon, stuff like that. I had the soup finished and on the table in less than 30 minutes. 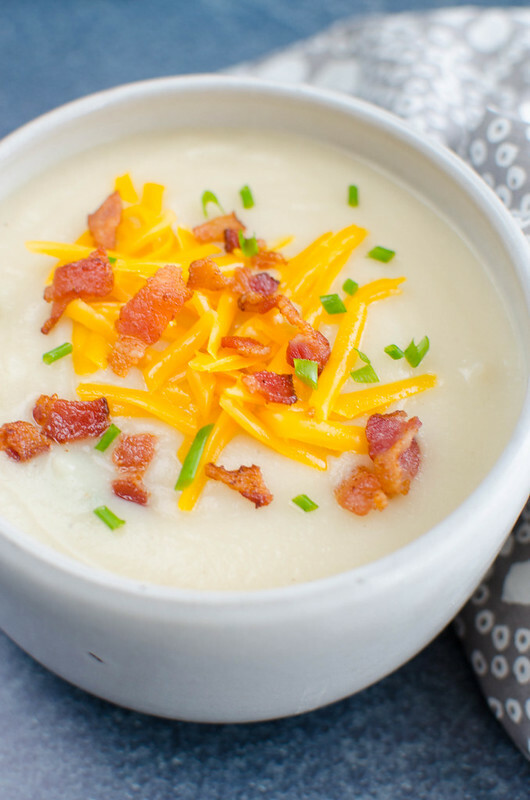 It’s delicious – like the loaded baked potato soup we all know and love but you feel a little bit better about it with the cauliflower. And how can you go wrong with anything topped with bacon and cheddar cheese? Heat a large soup pot over medium-low heat. Place the bacon slices flat int he pot and cook, turning a couple times, until crispy and most of the fat has drained from the bacon, 8 to 12 minutes total. Using tongs, transfer the bacon to a paper towel-lined plate, leaving the fat in the pot. Add the onions, 2 teaspoons salt, and 1 teaspoon pepper. Cook, stirring often, until the onions are translucent and soft, 10 to 12 minutes. Stir in the potatoes, cauliflower, and stock, cover, and bring to a boil over high heat. Reduce to a strong simmer and cook, stirring here and there, until the potatoes are very soft, 15 to 20 minutes. 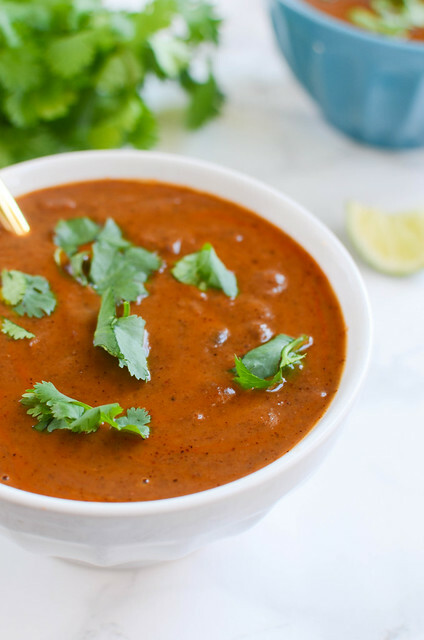 Puree the soup, using a blender in batches or a handheld immersion blender. Taste and season with additional salt and pepper, if you like. 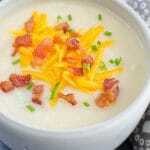 Slice or tear the cooked bacon into bite-size pieces and sprinkle it over bowls of the soup. Serve topped with sour cream, chives, and cheese.